What an awesome top! Love all of the unique detailing. Great heels too! You are right, this will be a versatile piece! Perfection!! I love this look! You are rocking the boho look!! Super cute! I was sent a similar top and not been using it much because I don't like that it shows my underwear. But this might work as a beach coverup, maybe? Love how you styled it though so I might give it another shot. This tunic definitely has a boho vibe and you've styled it perfectly! cute everything! love the jeans, top, and shoes! You're totally rocking this gorgeous tunic! Come check out my latest collab with Express and let me know what you think - Have a lovely week! Such a fun top! Loving the crochet and those jeans are so fabulous! Love this tunic!! Perfect for Spring and Summer! such a cute and casual boho look! love this :) pinned! I am loving that tunic and the pretty layered jewelry you paired with it! that top is fantastic! you rock it! You look so pretty in this boho look! Gorgeous, Rachael! I love the tunic and those shoes! Is that the wrap bracelet that you're wearing as a choker? I really like it. You look absolutely amazing here, I love the wire bottoms of your sunglasses and the chokers. I've never tried a tunic, as I'm not too tall, but this look is to die for! Love the look dear... you look stunning and fierce at the same time! Absolutely loving this top and how you styled it - it's the perfect mix between boho and urban chic! 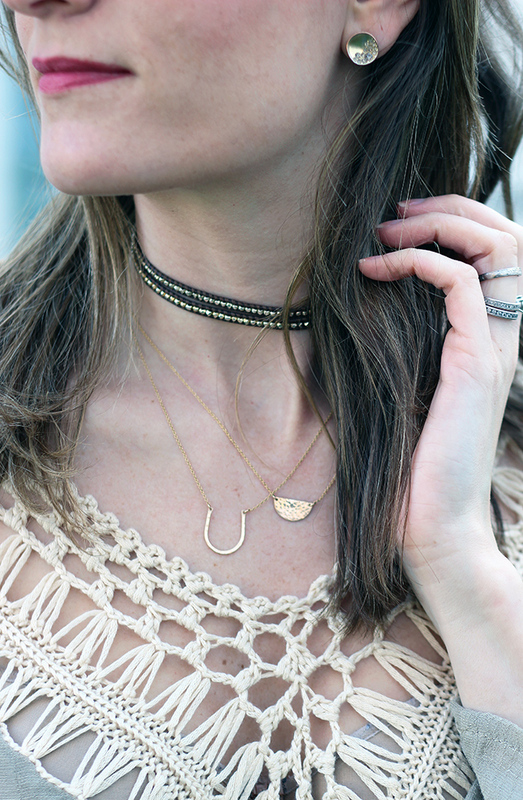 Love your tunic and choker! Those dainty necklaces and choker is way too cute!! What a fun tunic and loving the choker with this!